A Continental Can & Saucer. 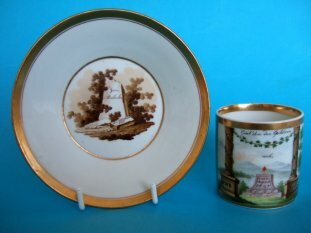 An early 19th.Century Continental coffee can and saucer. These pieces may well be 'married' as they have a number of differences. They both have text in German commemorating dates of 1817 and 1827. The saucer has an underglaze blue mark that may be a letter 'S' or 'J'. The can has incised marks. The saucer measures 13.2cm. (5.2 inches) diameter. The can stands 6cm. (2.4 inches) high. The can is very good, just a little wear to the rim gilding. The saucer has a hairline crack from the rim. 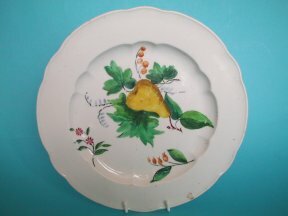 A French Soft Paste Plate. There is quite a lot of wear to the enamels and gilt. A glaze fault to the rim. also a short stress hairline at the rim. 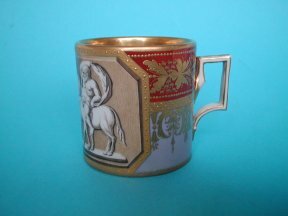 A superb Vienna porcelain coffee can. An incredibly finely painted coffee can from the early years of the 19th.Century. Painted with a classical mythology scene of Dionysus (Greek) or Bacchus (Roman) God of wine. The remainder of the can decorated with two ground colours and extremely fine raised paste gilding. The bas of the can marked with underglaze blue shield mark and impressed numerals, 804. indicating a potting date of 1804. Stands 6 cm. high. Very good with only slight wear to the decoration. There is a faint crack to the lower terminal of the handle. Berlin Porcelain Coffee Can & Saucer. c.1800. 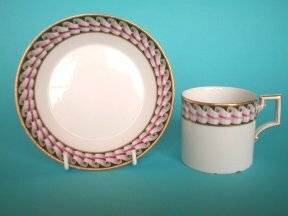 An attractive coffee can and saucer from the Berlin porcelain factory. Decorated with a simple neo-classical style 'ribbon' border pattern, the can with typical 'architectural' handle. The can has two small chips to the foot. No cracks. The saucer has a very well restored chip to the rim, which has some hard to detect over painting to the back of the rim. None on the front face and no cracks.